The Delta 1 Pro Magnetic Copy Stand II allows you to capture two-dimensional originals and small objects with ease. It adjusts to your requirements, featuring a steel column with nylon tension screws and reversible sliding camera arm with tripod and video pin. 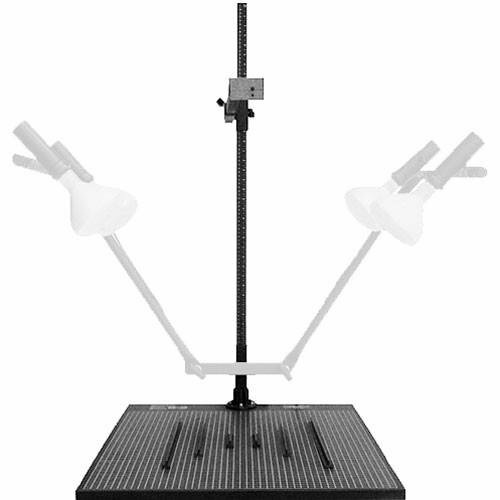 Achieve precise alignment with its centering adjustment from 4-13". Cameras are adjustable in height from 1/2-40" with the stand rated to hold cameras up to 4x5". The 24 x 32" laminated steel plate baseboard is silkscreened in 1/2" grids and includes four magnetic hold-downs. Copy lights are available separately (see Accessories section). Format: 35mm up to 4 x 5"